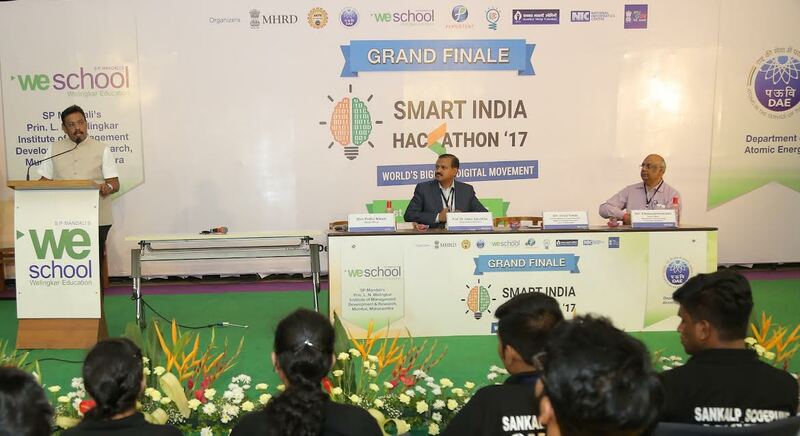 Mumbai: The valedictory function of SMART INDIA HACKATHON 2017 saw the unfolding of the digital solutions to 17 problem statements shared by Department of Atomic Energy devised in the 36-hours of marathon at WeSchool. SMART INDIA HACKATHON 2017, World’s Biggest Hackathon jointly organized by MHRD & AICTE, was inaugurated at the hands of Shri Prakash Javadekar, Union Minister for HRD along with Prof Dr Anil Sahasrabudhe, Chairman, AICTE at WeSchool campus in Mumbai. Last night PM Narendra Modi inspired the 10,000 odd participants across 26 nodal centers in India through video conferencing in realizing his vision to build a funnel for ‘Start Up India’, ‘Stand Up India’ through this initiative. WeSchool is privileged to be among the only two b-schools, in addition to the 24 Engineering institutes to be chosen for hosting this nationwide initiative. Mr K N Vyas, Director, BARC the Chief Guest at the valedictory function gave away the prizes to the top three teams along with Prof Dr Uday Salunkhe, Group Director, WeSchool. Shri R Balasubramaniam, Scientific officer, Dept. OF Atomic Energy Shri Praful Nikam, nodal officer, AICTE and other dignitaries were present on the occasion. The Hackathon also had another eminent guest, Shri Vinod Tawde, Minister for School, Higher And Technical Education, Sports, Youth Welfare and Cultural Affairs, Govt of Maharashtra paid a visit to WeSchool to interact with the 32 teams consisting of 237 young geeks from institutes across India that have been working hard during the 36 hr nonstop marathon to find solutions to problem statements shared by Dept. of Atomic Energy. Shri Vinod Tawde, Minister of School, Higher And Technical Education, Sports, Youth Welfare and Cultural Affairs, Govt of Maharashtra encouraged the participants to collaborate with the Government, “Come and join hands with the Department of Education in finding solutions to the challenges faced by us, as your innovation will help crores of students in Maharashtra.” He promised to extend all support by opening avenues and giving them access to government systems. The first prize of Rs One lakh and a trophy was awarded to ‘Team Braintumor Radionomer’ from B P Poddar Institute Of Management And Technology from Kolkata for its solution about extraction of information from imaging and relating them to diseases and outcomes in the form of an app for refraction index mapping by analyzing T2 images of human brain. The second prize of Rs seventy five thousand was awarded to ‘Team Tech Junkies’ of Mumbai’s VJTI for its solution about GPS mapping of resources in crisis management. The third prize of Rs fifty thousand was awarded to ‘Team TER-X ‘ From Chandigarh Group of Colleges, Faculty of Engineering, Mohali for Geotracking locations of Hospitals and blood banks with real time database of availability of blood. And Inspiration prize of Rs Ten thousand from Persistent Systems was awarded to team Sankalp_SCOP, Sinhgad College of Engineering, Pune for E–blood donation with a focus on Geotacking of hospitals and blood banks during disaster management. Out of the top solutions, the most relevant for progress of national agenda will be supported by respective Ministries that shared the problem statements and with NASSCOM stepping in to source funding opportunities it is envisaged that this nationwide initiative will be instrumental in creating a new wave of start-ups, boosting the entrepreneurial wealth of India and creating jobs for many.